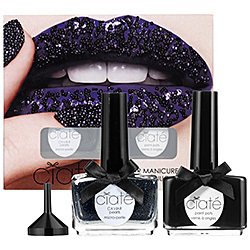 Caviar Nail sets are a touch on the pricy side, and each little bottle of beads contains about 1/2 ounce of beads. I think these sets are a nice option if you want to get something coordinated, and want to go to a store and buy it quickly. Otherwise, I recommend just buying your own beads online. 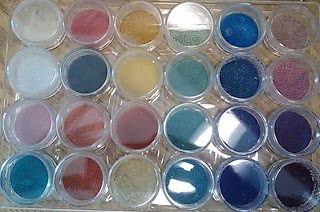 They are called glass micro-beads, and you can find them easily on Ebay for a fraction of the cost of buying it in a nail polish set. 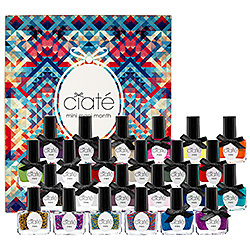 You will need a base polish, a clear polish, and micro-beads. Here I have metallic blue micro-beads, Sally Hansen Super Shine Top Coat, and Sparitual in Savant. First, do a regular manicure on yourself... trim up your nails, file them to your preferred shape, clean up your cuticles, and then wash your hands to get any oils and creams off of your nails. 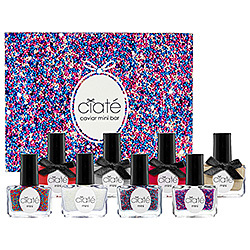 Now, decide which nail you want the "caviar" on. If you want it on every nail, do one nail at a time. Apply at least two coats of nail polish in your choice of color. I like to use clear or very pale polishes if I am doing the entire nail, and a brighter color if I am putting the beads on like a french tip. 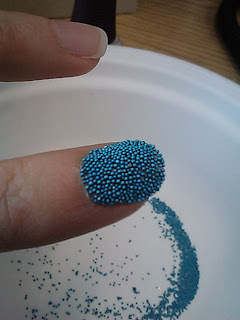 You need a thick coat of wet nail polish on your nail in order to get the beads to stick. 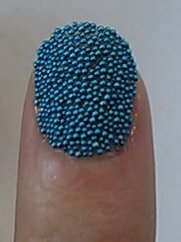 If doing the whole nail - while the polish is still wet (immediately after you paint it on), gently pour your beads over your nail. Do this over a bowl or other object that can catch the excess beads so you can pour them back into your storage container. 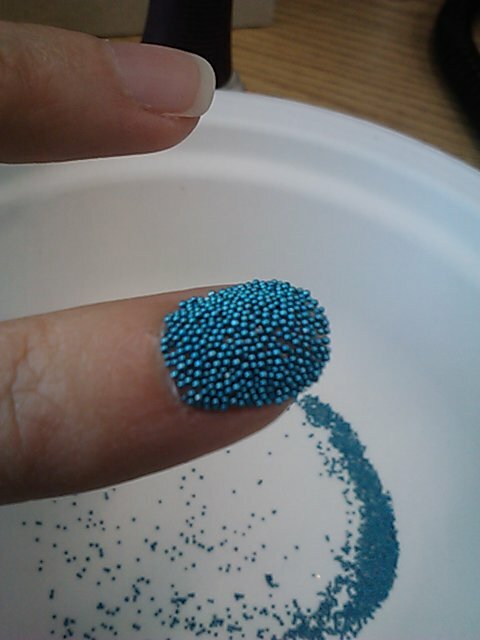 Keep pouring beads over your nail until the nail is completely covered. 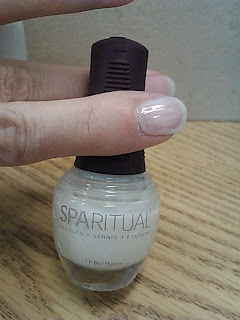 If you have bare spots, just keep pouring the beads over the nail, and eventually some will stick there. Well, they should. If they won't, then very carefully pick up one bead at a time and gently place it in the bare spot. To get the bead to stick to the bare spot rather than staying on your finger, make a rolling motion with your finger to stick the bead into place. Be very careful, or you will end up messing up the beads around the spot you are trying to fix. 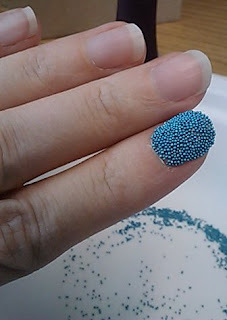 Now, with a very dry finger (any moisture on your finger will attract beads), gently pat the beads down into the polish. As you get them patted down and compressed, press a little bit more firmly. You are trying to get the polish to squish up the sides of the beads, but obviously not all the way up to the top. 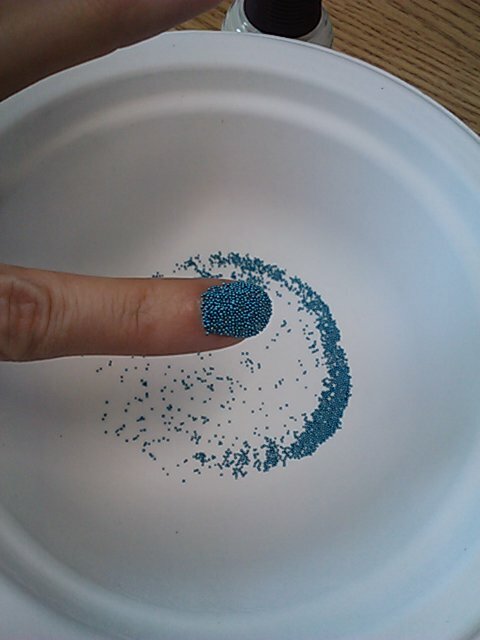 This is the process that gets your beads to stick to your nails. If you have any beads sticking to your skin, or extending past the end of your nail, now is the time to gently remove them. If doing a french tip - paint your nails with the base color and top coat and let it dry completely. Now, go back over the tip area ONLY with clear polish. Only put clear polish where you want the beads to go. Do one finger at a time! Now, gently lay your fingertip in your bead container. 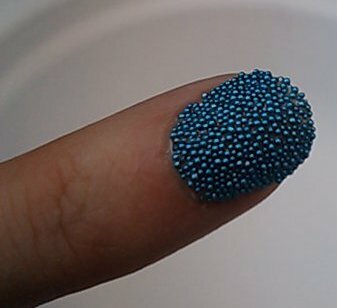 Don't shove your finger into the container, just lightly press the top of your nail to the top surface of the beads in the container. Keep doing that until the entire tip is covered. Now gently, with a dry finger, press the beads into the polish. As they are patted down and compressed, press a little more firmly to really stick them into the polish. You can use a tool (cuticle stick, spoon, chopstick, whatever) to gently nudge any rouge beads into a straight line for your tip curve. Keep in mind that this isn't going to turn out with a perfectly straight line with this method. If you want a perfectly straight line, you'll probably have to apply each bead, one by one. Ok, so now to finish. This really depends on what kind of beads you have. If you have metallic beads, which are usually covered in metallic paint, putting a top coat on your beads is going to make that metallic paint run. However, you can mitigate that by applying topcoats by gently touching drops of polish over the tops of the beads, and NOT moving the brush over the beads. 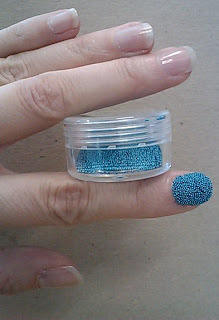 If you have glass beads that are colored from within, you can pop a topcoat over it with no problem. Applying a top coat will tone down the shiny metallic sheen, but it will keep your beads in place a lot longer. Keep in mind, if you did a good job of laying down a thick layer of polish, and then pushed the beads deeply enough into the polish, you probably won't need a topcoat to keep the beads in place. Of course, that all depends on how much you use your hands. Here is my bead collection, just to show how much variety you can get... and none of these colors are mixed, so if I start mixing colors, I get whole new looks! I bought my entire collection in one purchase, for about $15.